Hundreds of protesters, including 76ers legend Dr. J, Eagles player Malcolm Jenkins, and rapper Rick Ross, rallied in Center City in support of jailed Philly hip hop artist Meek Mill. NBC10's Aaron Baskerville has the story. 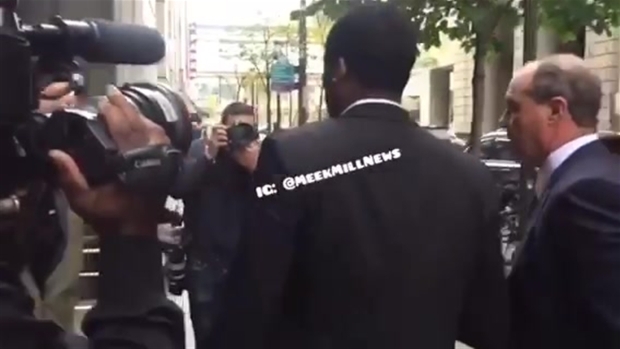 For a time on Friday, Meek Mill's legal team thought the rapper was getting a new bail hearing. But the court now says they made a clerical mistake. First Judicial District court spokesman Marty O'Rourke said Mill will not be in court on Nov. 27 as was listed in Pennsylvania's court record system. A court employee made a clerical mistake on Mill's case and the system listed him for a new hearing. O'Rourke said Common Pleas Judge Genece Brinkley had not granted the hearing and had nothing to do with the error. "It was just a mistake," he said. Mill's defense team had even been notified that the hearing was scheduled only to later be told that it was an error, attorney Brian McMonagle told NBC10. Philly hip hop artist Meek Mill was sentenced two to four years in prison for violating his parole. McMonagle has been pushing for Brinkley to step down from the case ever since she sentenced Mill, whose real name is Robert Williams, to two years in prison on Nov. 6. He is currently at Chester State Correctional Institution, where he was moved in recent days after initially being sent to Camp Hill state prison. The defense team accuses Brinkley of expressing herself "in personal, injudicious terms when ruling or explaining her rulings." The recusal request included some tawdry accusations against the judge, like a claim that she asked the Philadelphia-born rapper to record a version of a Boyz II Men song and include a shout out to Brinkley. Another claim accuses the judge of recommending Mill leave his management agency, Roc Nation, which is headed by Jay-Z, and rejoin his original manager, a Philadelphia man named Charlie Mack. Brinkley handed down the prison term despite a recommended punishment from the Philadelphia District Attorney's office that did not include jail time. She has overseen Mill's probation violation hearings for years since his initial conviction on drug and gun charges in 2008. Brinkley said Mill "does what he wants" despite repeated warnings. "Last week's hearing was a farce. It was a miscarriage of justice that lacked even a semblance of fairness," McMonagle told NBC10 in an email Tuesday. "Today, we asked this Judge to step aside and allow another Judge to bring justice to this case and to this citizen. This wrong has to be righted." Earlier Tuesday, three charter buses with large #FreeMeekMill slogans on their sides temporarily stopped by the Race Street headquarters of the Philadelphia police department in Center City. Their presence caused a commotion for a few minutes on the busy street near Franklin Square. The buses then headed toward Old City. NBC10 Skyforce captured video of the buses as they drove through the eastern neighborhoods of Center City. Two of three charter buses promoting the release of Philadelphia rapper Meek Mill from prison during their trip through Center City, Nov. 14, 2017. The buses appeared a day after a large protest outside the Criminal Justice Center near City Hall on Monday evening. That event involved some celebrities, including basketball hall-of-famer Julius "Dr. J" Erving and rapper Rick Ross. Brinkley's sentence immediately spurred fans and friends of the rapper to question the criminal justice system in Philadelphia. Supporters also began accusing the judge of bias toward the rapper.